In 2003, I introduced what may have been the first Lean transformation model. It described how leaders should execute the change-over from conventional management to Lean management. The model appeared in Better Thinking, Better Results (“A New Change-Over Model,” Chapter 11, pp. 248-254), the award-winning book that describes The Wiremold Company’s enterprise-wide Lean transformation under the skillful leadership of Art Byrne. The model I developed was based on a change-over method that we all know well: machine changeover (see A Revolution in Manufacturing: The SMED System, S. Shingo, Productivity Press, Portland, OR, 1985, pp. 26-31). The image below illustrates the process, which consists of four steps: 1. Identify and separate internal and external set-up, 2. 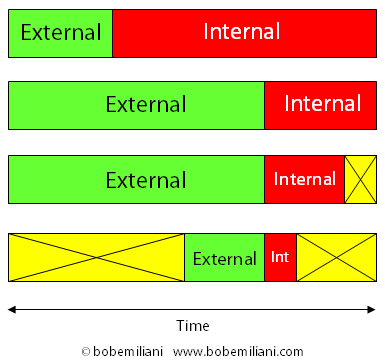 Convert internal to external, 3. Decrease internal set-up, and 4. Combine and eliminate tasks to decrease internal and external set-up. Remarkably, the machine change-over model also describes what happens in kaizen with respect to people’s knowledge and learning. The machine change-over model also describes what leaders must do with respect to their beliefs and assumptions about people, management, and other critical knowledge in the change-over from conventional leadership to Lean leadership. And, machine change-over model describes what must happen in a Lean transformation with respect to the issues and concerns that people have about the changes that are underway. The Lean transformation, it turns out, is nothing more than a fractal (small-to-large scale) change-over problem. People who have read Better Thinking often comment on the utter simplicity and practicality of the model and how it has helped them comprehend what change is and how to achieve change on three levels: kaizen, personal (leader), and organizational. If you already have a copy of Better Thinking, go back and read at Chapter 11. If not, pick up a copy to learn what you have been missing.